Hi again folks! 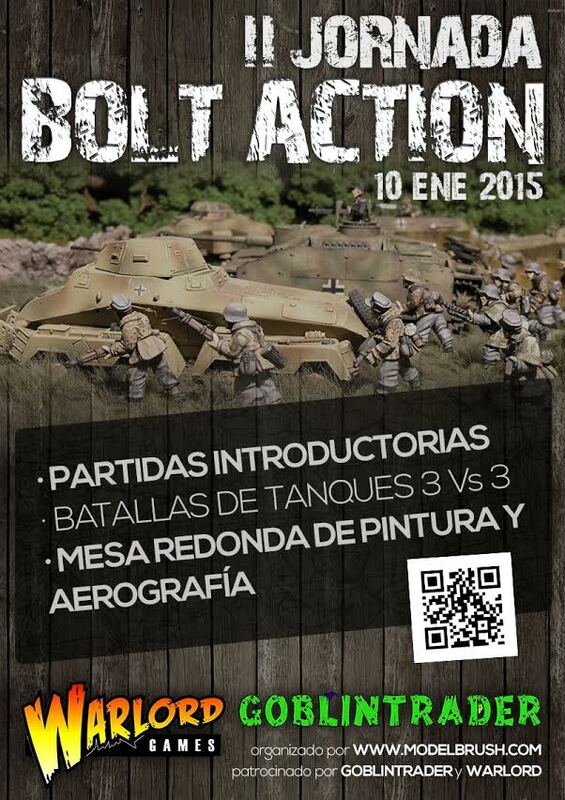 We want to invite you to the II Bolt Action Day that we’re doing in Goblintrader store in Madrid, the next Saturday, January 10th. On this second Bolt Action day will be doing many free activities: demo games, 3vs3 tank battles with special rules (see more below) and a round table where Rubén Torregrosa will attend all your questions. WHERE: Goblintrader Madrid. Enrique Fuentes 22, Madrid. All the activities will be completely FREE. 3 Vs 3 Tank’s Battles: During all day (stopping to eat). You can download the special rules here. Remember, you don’t need to bring your own tank! Demo games: morning and evening. We’ll show you how to play Bolt Action. Do you have any questions about painting your tanks or miniatures? : During all day Rubén Torregrosa (HeresyBrush), author of PaintingWar: German army in campaign (BreakingWar) and Painting Wargames Tanks (AMMO of Mig Jiménez) will resolve all your questions. Also, we have the great sponsorship of Warlord Games, and maybe a couple more. Thank you all for your support! !